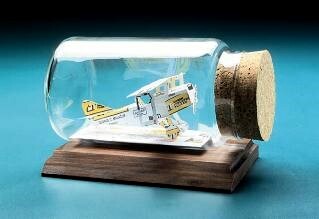 From old biplanes and military airplanes to corporate aircraft and military jets, Business Card Sculptures has gift ideas for pilots, aviators, flight school operators, aviation executives, aircraft mechanics and others in the aviation industry, who will be delighted with this gift or award. We have all kinds of gift ideas for pilots, but if you especially like the older planes, check out our all-new World War 1 Fighter Sculpture, the Biplane Sculpture or even our ever=popular Hot Air Balloon Sculpture! All items are shipped in a high-impact corrugated container. 20 business cards to be used in the sculpture. *Shipping and sales tax for Illinois customers not included.